The White Tiger by Aravind Adiga……. Written from the perspective of a driver in India, this book made me look at things a little differently – which is good. I happen to be an American living in India right now and I happen to have a driver. Most days I am thrilled to be so fortunate – but there are days when it seems bothersome. This book was a good reminder that my driver surely feels the same way. The author reveals the ending of the story in the beginning – that Balram murders his boss. This did capture my attention and make me want to find out why. Which may have been the main reason I got through the first 5o or so pages. It started off slow and did not pull me in right away. I was glad I finished it though. I am still trying to make a clear connection to the title of the book with the storyline – I am sure there is somewhere in the book that this is spelled out and I simply missed it. My best guess is that white tigers are rare and strong and that the main character of this book seems to be someone who is uniquely strong enough to survive in India. And not just survive – but succeed. 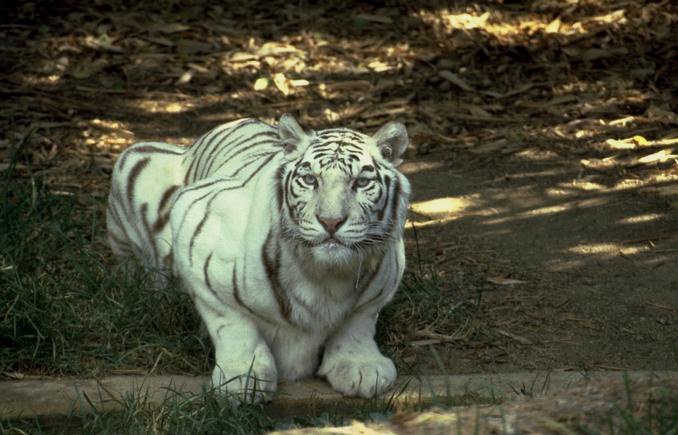 And like the white tiger – there are those who would like to capture him. Throughout the book, Balram sees wanted posters with his pictures on it. He seems to enjoy hiding in plain sight and taking chances in his own little game of cat and mouse. Balram Halwai is the main character and the book is basically his letter to the His Excellency Wen Jiabao the Premier of China who is planning to visit India. In his introduction, Balram explains that even though neither man speaks English, this letter must be written in English because that is the only language in which it can all be explained. This is an interesting paradox in India. It is said to be an “English-speaking” country and in many ways it is. But often things do get lost in translation making for muddled and frustrating communication. I was never clear on why Balram was writing this letter. Mr. Jiabao was planning a visit to India and Balram claims he wants to share with him the real India. But Balram was a calculated man who really only took action that would result in his own personal gain. So, I found the premise of the book a little weak. Beyond that though, it was fascinating to “hear” what a driver might think of the people he works for. I think that those of us with drivers forget that the drivers have opinions too. The drivers in this book were mistreated and laughed at and disrespected in many ways. I don’t know how common that really is but we certainly forget that they might not always like us and the things we ask them to do. That they might laugh at our jokes but that sometimes might only be because they believe (or fear) their laughter is tied to keeping their job. There was also nice insight in the book into the hierarchy of staff in India. Balram really is not that likeable of a character. He does not send money to help his family back in the village. He is certainly selfish and cocky and clever. And yet, he is someone you can sympathize with. Balram’s predicament is one you often see in India. People with lots of smarts do not really have the opportunity to nurture their abilities and are often tempted to use their smarts in clever ways just to survive. And unfortunately, that means sometimes breaking the law. Balram writes the book at night by the light of a flickering bulb. That is a little how this book felt when I was reading it. Like we were sneaking a peek at the other side of life in small little flashes – and sometimes it is better to see reality in flickers rather than all at once. ← In the Meantime………A funny thing happened on the way to the future…..